I really thought I was keeping the Toronto pre-release show pretty simple. And I believed this right up to a few days before showtime. 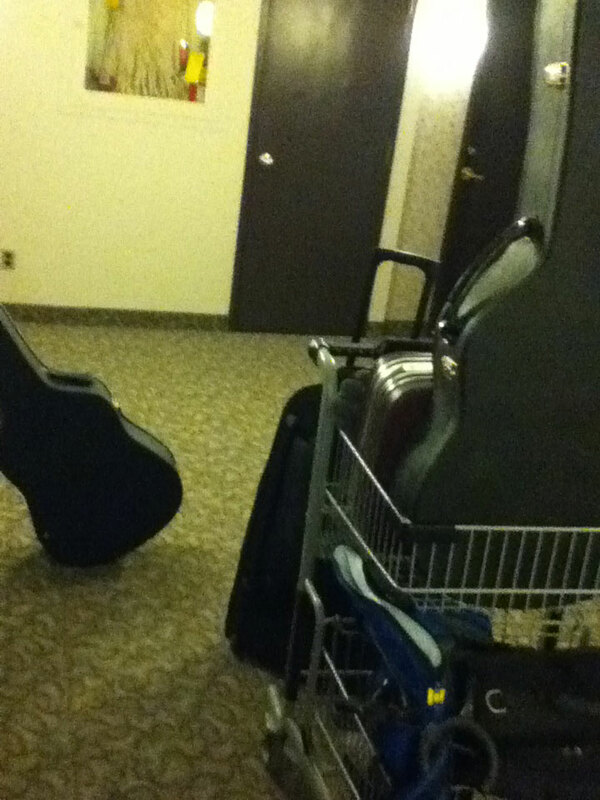 Although I probably should have known better as I left my apartment in Ottawa. What I should have known was that I had to coordinate the set up of a rental P.A. system, a slideshow intro for two performers, that two out-of-town couples were well taken care of, three never-before-used stomp boxes, lighting logistics, a constantly changing guestlist and of course, the worst weather(or weather warning) of the season. Add to this the fact that I was trying to deal with these details with a shirt, tie, sweater and fitted faux-leather bomber jacket on, and it was quite the ordeal. Albeit a very fashion forward ordeal. So what began as a musical extravaganza featuring a few bells and whistles became The Bells and Whistles Super Stress Show, featuring a bit of music. But that’s okay because the music served an oasis of calm in the middle of gigzilla. I was hardly nervous at all and yes, technical glitches did occur but I tried and hope I succeeded in moving past all of it with professionalism to deliver an entertaining show. Nonetheless, the things people actually said to me at the end of the night was just all kinds of nice and made me feel like it was all worthwhile. And you know what? It was. Even if the grand piano’s supports had given out and crushed my legs and carefully colour-coordinated pants, it would have been worth it. Because having your own professionally produced debut CD, releasing it in your hometown to attentive, close friends and family and hearing their words of praise, encouragement and support can only make you strive onwards and upwards. Thank you attendees. It was my humble honour to share some music with you for an evening. We’ll do it again. Soon. I debuted my two of my newest songs live at an open stage the other night. It’s been awhile since I’ve played live and it was a good feeling to “be back” of sorts. I was at Supermarket in Kensington and this seems like a pretty high profile open stage. By which I mean it’s very much a showcase of people who want to show off. Me included. It helps that there’s a full band setup on stage so there’s a wide range of musical styles represented. Which is a good opportunity for me to sit back and silently pass judgement on the acts. Yes, I’m that shallow and competitive. But not delusional though and I’ll readily admit that many of the acts schooled me. But mostly because they played a style of music that is very condusive to large, late night drinking crowds who really aren’t there to see you. So up-tempo full-band blues and rock jams always got a good response from the crowd. Singer/songwriters not so much. A couple of weekends ago I played my first benefit. It was for METRAC, a local organization which raises awareness of violence against women and children(metrac.org). It was a very fun evening with 20 or so acts going on in a span of 4 hours. Pretty epic but if you think about it, it’s essentially just a by-invite-only Open Stage. 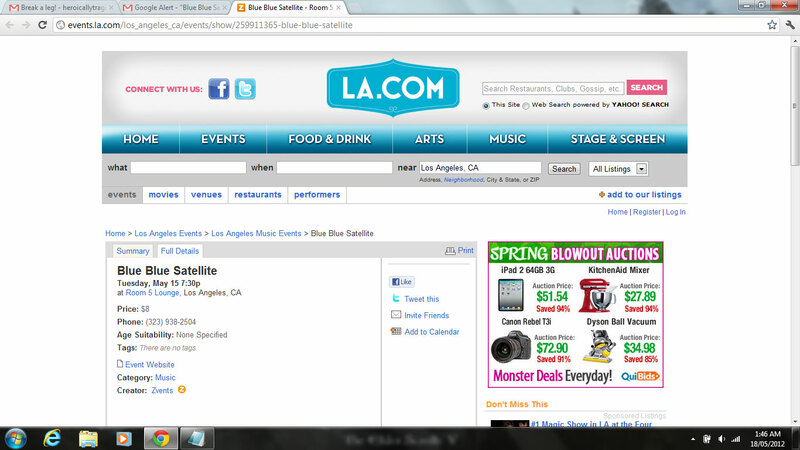 But hey, Blue Blue Satellite got an invite, so who am I to judge? It may have been a rapid-fire 10 minute set but it was a great cause. I was lucky enough to have had a very stable and happy childhood so the thought that there are women and children in my city who are victims of violence or who live in fear thereof, during this time of year especially, is sickening. I hope the money we raised that night does some good. Regarding the show, I did two songs…tried to keep the mood light, so I did a Christmas song and an upbeat song(covered Sara Melson’s “The Holidaze” and did my own “Photographs and Wine”). I guess it’s a good thing that we only had 10 minutes…any more and I would have run out of happy songs to sing. And if there’s any truth to the “know thy audience” adage, well, a Sunday holiday crowd full of children was no time to be playing my moody, melancholy shoegaze tunes like “The Fair’s in Town Tonight” or “Against the Northern Sky”. So thanks Monique Barry(organizer), Cadillac Lounge and METRAC for a good time! 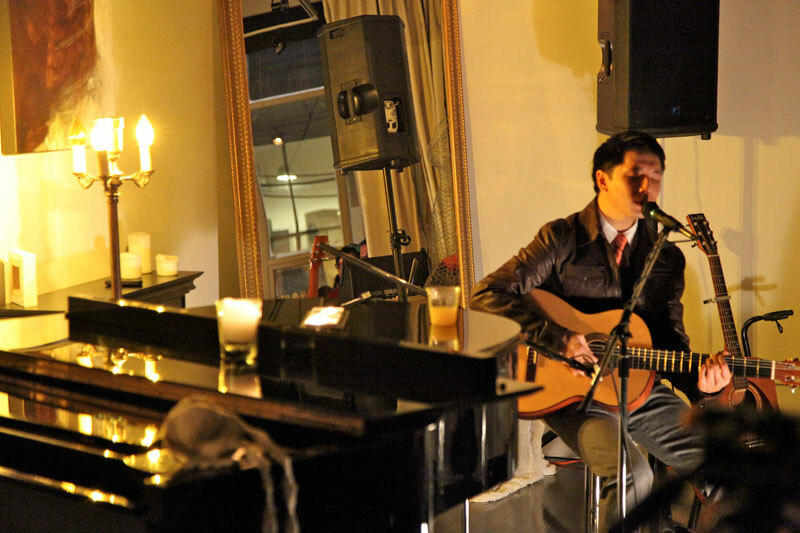 Two Sundays ago I played a show that was not at the Free Times Caf�. Take a moment to wipe up your spit takes. I played the Cadillac Lounge in Parkdale as part of the monthly Songwriter’s Expo(http://www.songwritersexpo.com/site/this-month.html). It was a very good show. Probably my best all-around show. My performance was tight, the crowd was kind and the sound was handled very well and professionally. It was a quick 30 minute set so it was hard to pick songs especially since I was debuting 3 new songs(I wanted to do 4) and I had planned to do a huge crowd pleasing cover(which I cut as well). Still though, I guess it’s a good sign that I’ve got a big enough repertoire that creating a set list is not a trivial task. Or perhaps it means my live shows are not evolving as quickly as my songwriting ability. In fact, I’m sure that’s it. Anyway, Kirk Hammet from Metallica once said “To imitate is to create, you have to start somewhere.” And ain’t that the truth for Blue Blue Satellite. I have to admit that few of my songs are 100% original. There’s always some little hook or maybe a melody, sometimes more sometimes less that’s borrowed or at least inspired by another song. So for fun, here’s the setlist from my Mar 22nd show along with the source(whether on purpose or not) of its inspiration. Oh Arizona – this may actually be a full original! Now then. I’ve come to regard New York City as the mecca of modern popular western culture. There just seems to be an aura about New York that beckons people no matter what their interest…be it sport, music, fashion, art etc. I’ve been lucky enough to visit New York on a number of occasions and after getting all the touristy stuff out of the way on earlier trips, I decided on a recent trip to find an Open Stage down in Greenwich Village(where Bob Dylan and other legendary musicians got their start)�and perform a few songs…thus earning the right to say that I’ve played in NYC. And earn that right I did…with the help of openmikes.org, I found a cool, un-pretentious little place in the Village called Caff� Vivaldi and performed “Against the Northern Sky” and a more ubscure tune of mine called “La Dance” which is a French song I wrote which I thought would hold people’s attention a bit more, knowing how Open Stage(or Open Mikes as the U.S. term seems to be) audiences tend to be musicians simply waiting for their turn. The audience was very receptive to my tunes…I got a few kind compliments and met�some musicians who invited me to Kenny’s Castaways down the street after Vivaldi’s open mike ended. At Kenny’s the audience was pretty sparse since it was midnight on a Monday so I�decided to give ‘er and played the more upbeat “Sister Rachel” and “Smiling Hoover Catastrophe” again to a good reaction from those who were there. The New York talent was solid…not as phenomenally heads and shoulders above Toronto’s as�its storied history made me expect, so I felt very comfortable and would recommend these two�venues to anybody who’s looking�to play New York. No, this blog is not some self-gratifying pat on the back about how I’ve now played in NYC, this is all leading to something: given that I now have played in the area where Bob Dylan once played, I posted a new song…well, actually it’s�an old song I recently recorded but it’s one that’s as Dylan-esque as I’m going to get since I’m just a casual Dylan fan. So check it out…it’s called “I Can Tell” and it’s on�my myspace homepage. My latest show was on November 25th. It was a good show because I was very well prepared for it. This time around I actually rented some rehearsal space and actually rehearsed(even though the room smelled of feet…who the hell takes their shoes off to rehearse?!). Unfortunately, this show was many trials in the making. I was originally supposed to play with a cellist. We got practicing a�few times�but then she had to withdraw. Then I starting collaborating with another singer but she got laid off from her job just before the show. And even when she soldiered on, she got sick days before we were hitting the stage. And even at the show at the Free Times, I was upset�to find out there was no host, so it was pretty much a DIY evening for *everything* from setting up the sound system, to introducing the acts, to passing the jar around. It’s amazing we didn’t have to serve drinks or unclog the toilets… the crowd was a little sparse too. So this was a good�test of the old “Show Must Go On” adage and go on it did and�I still had a great show because I felt I was tight, I debuted a handful of new songs and�fun covers and the duets I�did with my�friend Jenn�complete with recently added harmony turned out pretty good.�And of course the�fabulous cheering section of co-workers from my job. The rest of the performers were top notch as well: The Om Tree Folk Collective and Amanda LeBlanc. 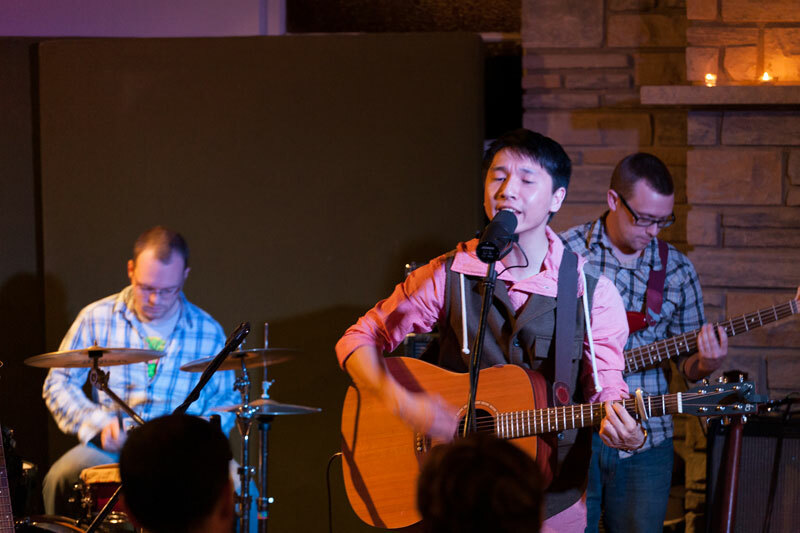 Last Wednesday I played yet another show at the Free Times Caf�. And what a show it was. The crowd was on fire that night thanks in no small part to a good 10+ lovely young ladies from my workplace that came out to support me. They really took the energy of the crowd to a whole new level and it made the place come alive. But even though a dozen girls cheering for me is always welcome, I have to say, my performance itself was slightly disappointing. I made some key mistakes here and there, my mandolin became horribly out of tune(even after I did the unthinkable and re-tuned it on stage), and the way my loop pedal integrated with the sound system was less than ideal. Still though, I definitely fed off the crowd and I guess it helped my stage presence be distracting enough from the less-than-stellar musicianship seeing as the feedback was pretty positive. I look forward to my next show…gonna be tough to top this one but I still have a trick or two up my sleeve…and maybe even a song!